iTunes users have complained that they faced issues when installing iTunes on Windows 10/8/7. This error can also appear during installation of iTunes updates. If you have encountered this error, there are some things you can do to resolve the issue. Either one of the tips outlined above can be sufficient for resolving your iTunes installation error. However, in order to use these tips, you need to spend a bit of time. You also need to have a very good operational knowledge of your system and its directories. Repair iTunes Connect Issues: iTunes could not connect to this iPhone because invalid response, the value is missing, error 0xe8000084, etc. 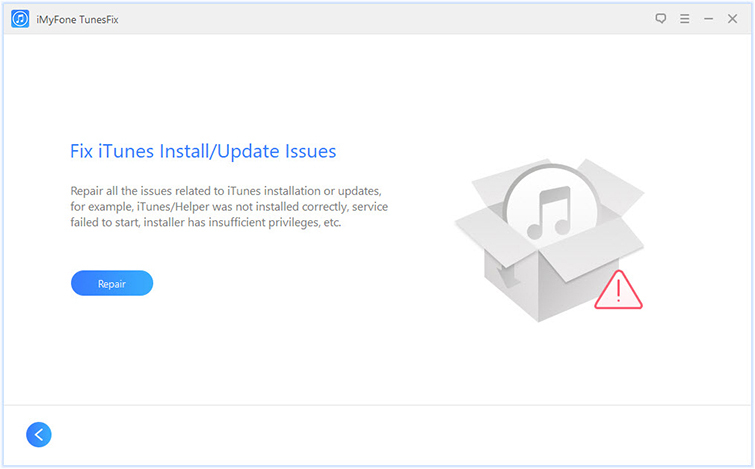 Fix iTunes Install/Update Issues: iTunes/iTunesHelper was not installed correctly, installer has insufficient privileges, error 2, error 2503, etc. Repair Backup/Restore Errors: Backup was corrupt or not compatible, backup session failed, and other unknown errors. Solve Other iTunes Problems: iTunes can’t start because .dll missing, iPhone could not be restored/updated, error 1014, etc. Step 1: Launch iMyFone TunesFix and it will automatically detect your iTunes and components. If your iTunes is incomplete, it will show you the specific status of your iTunes and allow you choose to repair it. Note: If you have repair it, you will find your iTunes has been installed or updated. Step 2: Or you will be brought to the home interface where you can see all the options available to fix your iTunes issues. Choose "Fix iTunes Install/Update Issues". Step 3: Click on "Repair" to start the process. During the course of fixing the error, TunesFix will help you download and install the repair drive. Once this is done, your iTunes will work properly. Completely uninstall iTunes and its related software components (also delete iTunes user data if you want). Remove iTunes old backups selectively in bulk or all at once, including hidden iOS backups left by third-party software. Clean iTunes to free up computer and boost performance of iTunes and computer: iTunes/iOS update files, cache, cookies, logs, and other junk files. 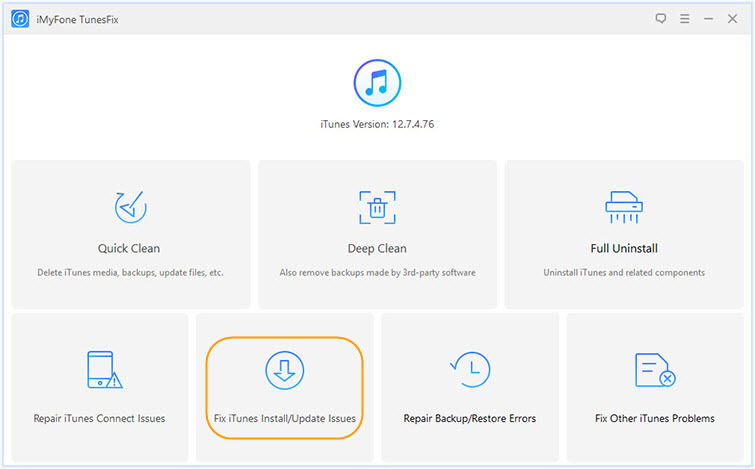 If you have been having problems with installing iTunes or its updates on your Windows 10/8/7, you may need to find and copy iTunes installation package. Once you encounter the error, don’t click "finish" on the installation dialog. Instead, leave that dialog open and follow these steps. Step 1: Open Windows Explorer and type "%temp%" in the address bar. Then hit the "Enter" button on your keyboard. Step 2: You will be directed to a page titled "C:\Users\Your Username\appdata\local\temp". Once you are on this page, look for a folder called "iTunes64Setup.log". If you use a 64-bit system or "iTunes32Setup1850.log" if you use a 32-bit system. Step 3: Once you find the folder, open it and scroll down. 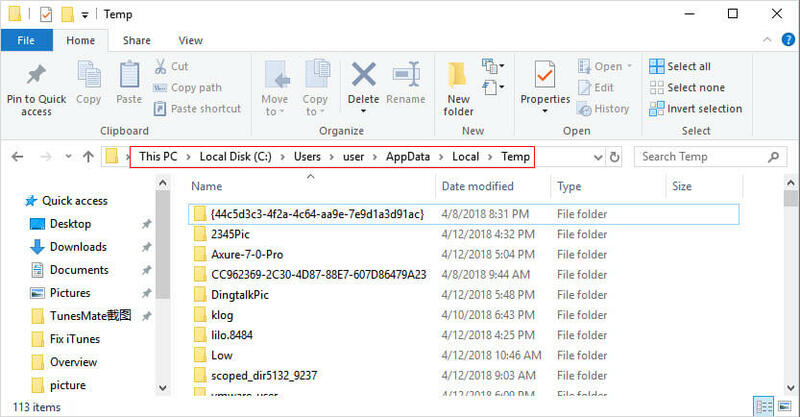 You need to look for these key files: "C:\windows\system32\msiexec.exe", "C:\Users\Crusisxx\AppData\Local\Temp\IXP593.TMP\iTunes64.msi" and "INSTALL_SUPPORT_PACKAGES=1". You will find them in a temp called "IXP593.TMP". Step 4: Once you open the temp folder, copy all the installation packages there, create a new folder on your desktop and paste them there. Step 5: After doing this, you can now click "finish" on the iTunes installer dialog. Step 6: From the new folder you created on your desktop, run "iTunes64.msi" or "iTunes.msi". After doing this, you can now run the iTunes installer. This process may be a bit complex but if you follow it exactly, your iTunes should install successfully. Step 1: Ensure you have the latest Microsoft Windows Updates. If you don’t, you can visit their website here. Step 2: Ensure that you have the latest supported version of iTunes for your pc. Step 3: Temporarily disable or uninstall conflicting software like security or antivirus. 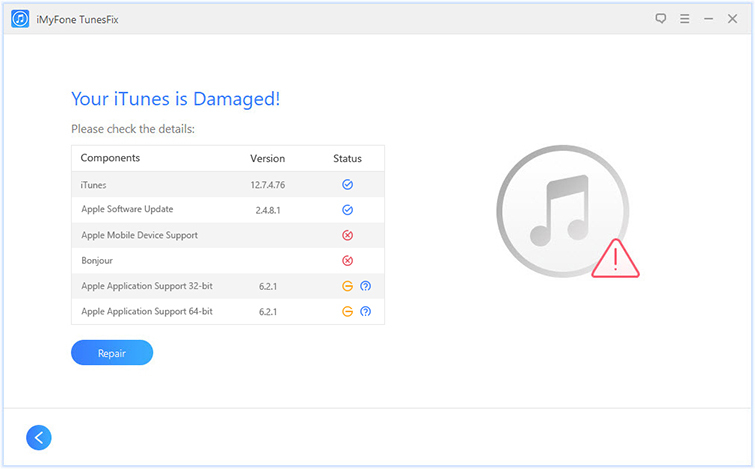 The iTunes installation processes may be red flagged by this security software. Step 4: Restart your computer and then install iTunes again.